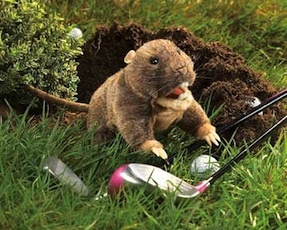 Folkmanis 2923 - So real looking this GOPHER PUPPET could pop right out of the ground to ruin your golf game! This little troublemaker features a movable mouth, cute buckteeth and long claws made for digging. FORE! Movable mouth and all legs. Measures 14" x 7" x 4.5".